Guard Post 117 is one of two U.S occupied positions watching over North Korea. On both these hills were several bunker positions as well as observation post. 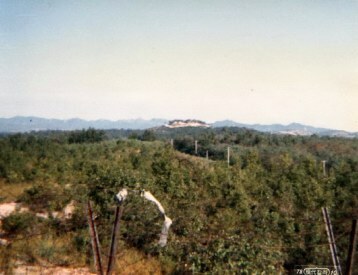 The mountains in front of hill 117 are all part of N.Korea and we could clearly see North Korean positions observing us at the same time. Most days were spent in small bunker positions and nights were spent mostly on patrols.This photo was taken from the south barrier fence line.